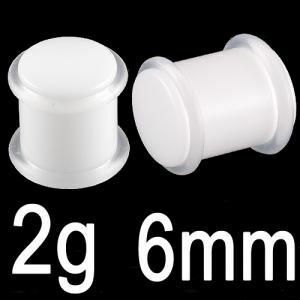 You will receive 1 Pair (2 Pieces) of 2g (6mm) White Color Acrylic Ear Plugs with Double Silicone O-rings which are comfortable and lightweight. All item is exactly as shown in the picture and the item will be shipped with beautiful jewelry box or pouch at no extra cost. Please use PayPal for all payments for fastest delivery. We also accept Visa, Mastercard, American Express and Discover through www.PayPal.com. 14 days from the day you receive the items.